Crazy in Suburbia: Has Walnut Creek's downtown construction mania killed Christmas? Has Walnut Creek's downtown construction mania killed Christmas? Wow, I thought only the Grinch, Scrooge or Mr. Potter (above) could take the cheer out of the holiday season, but it turns out the massive reconstruction of Broadway Plaza is "so extensive" that Santa won't have a home in Walnut Creek this holiday season. Elisabeth Nardi reports in the Contra Costa Times that the mall's multi-year, quarter-billion-dollar renovations means Santa won't have his usual storefront, and such holiday staples as the holiday lights parade will be canceled and the Hanukkah menorah lighting will be moved. Nothing will return to normal for another two years, the Times reports. As usual, Broadway Plaza, downtown business association types and city leaders are trying to put a positive spin on all this. One day Walnut Creek will be even more fabulous than they like to imagine it already is. They say, there will be all those sales tax revenues from when Broadway Plaza adds those 230,000 square feet! Meanwhile, these business and city leaders come off as tone deaf to the fact that a lot of people who actually live in Walnut Creek are getting a bit fed up with all the traffic and hassle and rightly question whether greed and crass commercialism have replaced any sense of true culture or community spirit in the civic ethos. 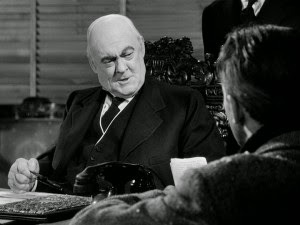 Wow, has the greedy small-town mogul Mr. Potter of It's a Wonderful Life come to represent Walnut Creek's moral and cultural compass? Has he been the guiding spirit all along? One has to wonder when a spokesperson for Broadway Plaza described this shopping mall, with many of the same generic shops you find at shopping malls all around the country, as the "heart of Walnut Creek." Well, apparently there is more irksome news, according to the Times: there have been fewer spaces at the city’s garages and lots over the past year -- no kidding! -- apparently because of what apparently is the city’s not-so-well-timed decision – with all this Broadway Plaza and other downtown construction coming to fruition -- to raise meter rates and increase enforcement hours. Interesting planning choices among city leaders. For so long the city was urging us, nagging us, to give up parking on the street and park in city garages. There is parking there, they proclaimed and proclaimed. No, there isn't. There really isn't. Parking supply will be tight, and “anecdotally,” the Walnut Creek Downtown association has heard that business is down over the past year. Even more reason to shop on cyber Monday! I expected disruption when I visited in summer but it was worse than I imagined. Nice to hear from you. Of course, I don't post here too often. Yes, it is pretty bad. Martha, all in all though I'd rather be in W.C. this xmas but family etc mean England it is...one day though! Professional writer and editor, blogging about the joys and oddities of life in a Bay Area suburb.